Today I have the beautiful, slightly rainy and full of laughs Ilam Park engagement shoot of Amy & Gordon. If you don’t know Ilam park it’s a National Trust property siting in the heart of Ashbourne right next to Dovedale which has a very popular walk with lovely stepping stones across a wide river. Both of these beautiful areas are located in the forever beautiful Peak District and are definitely worth your time should you have a lovely Sunday evening stroll to plan. 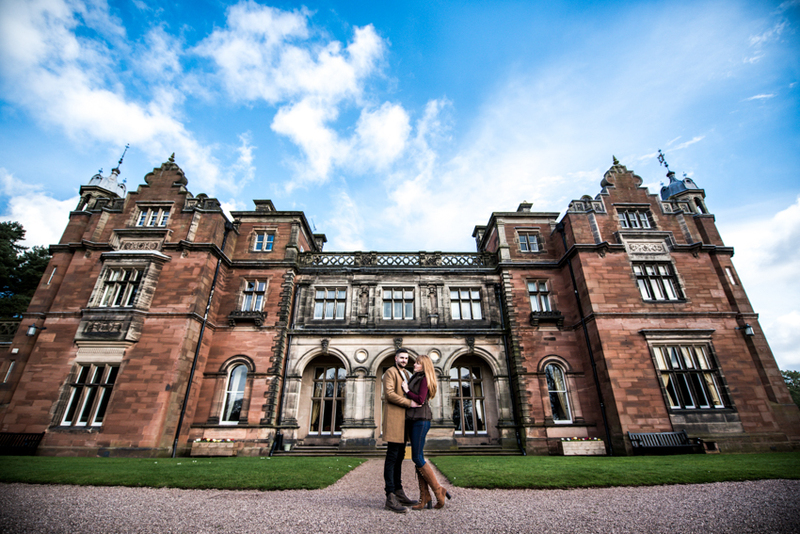 Amy & Gordon are getting married this April at the forever lovely Yeldersley Hall which is also located in Ashbourne! This is actually the third time Amy, Gordon and myself have tried to do this engagement shoot. Originally it was planned as a secret for their anniversary in December. The abrasive winter weather put a close to those plans then in February we were let down again when it just seemed to rain all day before changing to glorious sun and blue skies after we’d already cancelled the shoot. Third times the charm they say anyway. There was less than a 50% chance of precipitation planned for our mid March engagement shoot in the middle of storm Gareth which was resulting in days upon days of Yellow wind warnings everyday. With the above stats we decided to brave it. As I drove into Ilam Park at 16:00 on a lazy Sunday it started to pour and pour it did. To say I was annoyed is putting it lightly. After a quick chat and a little meet and greet with the dog we were actually lucky enough for the rain to stop, so we headed out. Amy & Gordon started with the famous line “we’re really awkward and have no idea what to do”. It didn’t take long for their great relationship to quell their awkward vibes and within seconds were just themselves in front of the camera. We had a great time wandering around the historic Ilam Park including the ever majestic Ilam Hall. We had planned to also head down to Dovedale to grab a few photographs around there but it was just too blustery and I was sure we’d regret it if we did as the heavens were only just holding back. Never wanting to let an environment limit me I hopped a wall into a water logged field at one point to grab a water line reflection of Amy and Gordon perched on a wall. One of my favourite shots of the shoot including anything with the full greenery backdrop where I was actually taught by Gordon about wild garlic which was so pungent it managed to make it’s way past my congested sinus’ to almost knock my cold straight out of me. I had another awesome time meeting one of my many couples whilst also shooting some photographs which they’ll cherish forever. 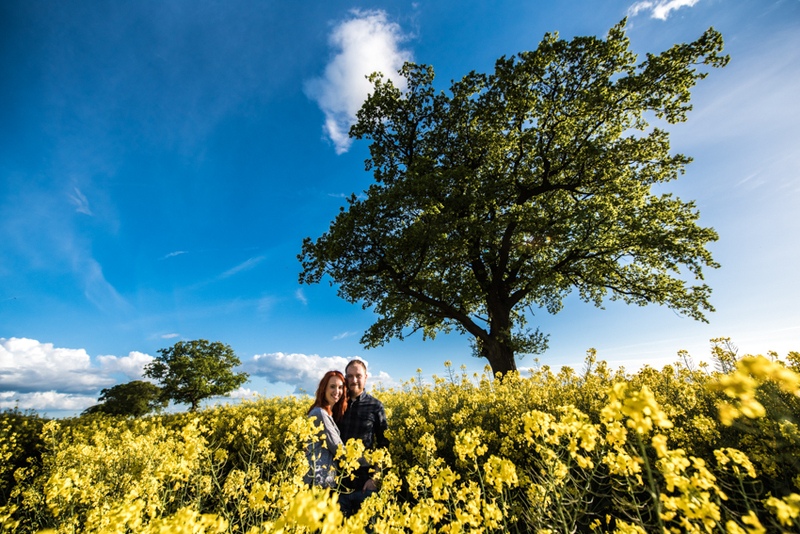 Looking for a Ashbourne Wedding Photographer? I’m a relaxed and informal Stoke-on-Trent wedding photographer who often ventures further afield including Staffordshire, Derbyshire, Cheshire, Shropshire and the rest of the UK. I don’t charge for my travel or accommodation as I love the look of different landscapes in my photographs. If you are interested in having me photograph your wedding whether it’s in Ashbourne or elsewhere then CLICK HERE to drop me an email about your day. If you’d like to hear a little bit more about me, my life and my sausage dog you can click here to find my about page.